#DiverseKidLit for June. Share a link or find the latest diverse book recommendations here! I'm back! So I failed a bit in my goal to share an #IMWAYR post once a month since the baby has been born, but that's ok too. Maternity leave has definitely cut into my reading (especially my easily going-to-the-library time to check out new books and picture books), but I am certainly learning quite a bit more about the world of board books. 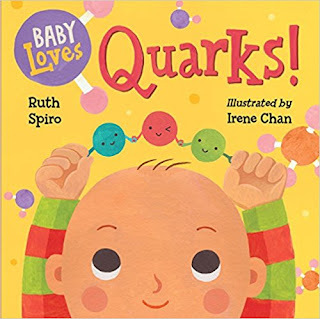 Baby Loves Quarks! by Ruth Spiro and illustrated by Irene Chan. This was the first autographed book I bought for my baby, way back last summer at Nerd Camp #nerdcampMI. I had met and chatted with Ruth Spiro the previous year at Nerd Camp and was excited to add this title to my collection. The Baby Loves Science series introduces actual science topics in unique and informative ways for the youngest of readers (Coding, Thermodynamics, Gravity, and more). Plus the illustrations feature a variety of diverse babies as subjects. Who wouldn't want to get out their building blocks after learning about quarks? 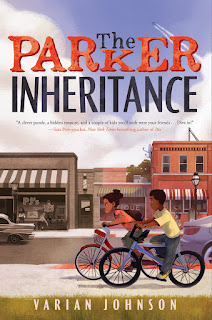 The Parker Inheritance (2018) by Varian Johnson. This is an engaging mystery / quest book with a historical (and Civil Rights) component. Read my full review about this must-read book here. 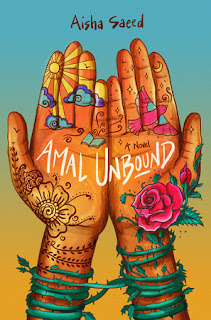 Amal Unbound by Aisha Saeed is a middle grade novel set in modern Pakistan that wrestles with issues about economic exploitation and indentured servitude. Read my full review about this great new #ownvoices story here. 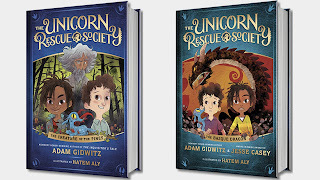 The Unicorn Rescue Society (series) by Adam Gidwitz and illustrated by Hatem Aly. Read my full review about this great new series here. I certainly want to read The Parker Inheritance and Amal Unbound, Katie. Thanks for the reviews and for pushing them toward the top of the list! Amal Unbound was so powerful, I was able to read an ARC, and I can't stop recommending it! I thoroughly enjoyed The Parker Inheritance and Amal Unbound! I've been thinking about adding the Unicorn Rescue Society series to my TBR pile. So thanks for sharing it, this week. Enjoy your maternity time. I'm sure everyone's telling you it will fly by, already. Ahhh, what precious days! Have a great reading week, Katie! I love the Unicorn Rescue Society so much! I cannot wait to read book 2! The Spiro book is really great. I loved Amal. I am looking forward to reading The Parker Inheritance. The Gidwitz series seems fun too. I really need to get to The Parker Inheritance soon - I've only heard people gushing about it. Loved the first Unicorn Rescue Society, I need to read the second one still! And congrats to you! Your reading time will eventually come back. Enjoy this time with your little one!